As professionals, whether it be in marketing, SEO, Social Media or any other area, we are all (or should be) continually striving for improvement. The world in which we work and operate in is constantly changing and the speed at which it does so increases every day. This makes our professional, and personal for that matter, development efforts harder and harder to keep up on if we’re not careful. A way to battle the increasing velocity is to write your goals down. A 1979 study done by the Harvard Business school suggested that people who write their goals down were 95% more likely to achieve them than those that did not. There are surely a lot of reasons for this, but the bottom line is that’s a number I am not going to argue with. As you can see you’ll take a look at (and most importantly, document) what your strengths, weaknesses, opportunities and threats (to improvement) are. By using the diagram you can see that there are internal and external factors helping you to identify your areas of control. I usually start with the opportunities area. That’s where I focus on areas that I have exposure to but need to improve on. The rest of the fields would center around that. Often, my opportunities field is filled with areas I would like to learn more about as well. This is a great way to help move towards goals you wish to achieve and identify all of the threats and strengths that will either work for or against you. I personally do this on a quarterly basis. This gives me enough time to work on the plan I develop from the SWOT and hopefully achieve some success to reflect on. In my mind, any more frequently and you are just setting yourself up for frustration. Who needs more of that? Once you’ve got your SWOT analysis done with your goals in mind write up a plan for how you are going to overcome the identified threats, maximize your opportunities and leverage your strengths. Include in this plan milestones along the way, measurements you’ll use (remember SMART goals?) and specific strategies for your accomplishments. In time you’ll find you are likely keeping a faster pace towards accomplishing your goals and overcoming the obstacles along your way. So. 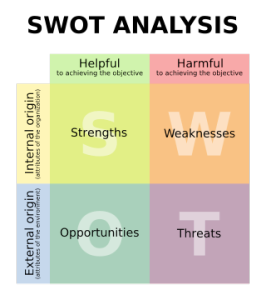 That’s how I use a SWOT analysis to further my professional development goals. Do you do something like this? I’d love to hear how you measure and keep track of your growth! I should add this post was inspired by a conversation I got into with Lyndit on Twitter So – for that I thank you! Love the title. One of things I love about your post is that you have found ways SWOT works well for you. Starting with opportunities and reflecting on your SWOT on a quarterly basis gives you some excellent structure. I love the whole idea, and very proud to hear another person it using SWOT in their personal and professional development. @Lyndit – Thanks!!! Glad you found it useful. For me – it’s the best model I’ve found to really look holistically at my goals and everything that could threaten them. You are right about knowing your strengths and weaknesses. Than you need a strategy because with out one you are just a fish out of water.